Generally pleasant fall weather provides an opportunity for fall weed control, and for soil sampling. When it comes to soil sampling, how the samples are collected will effect what information can be gleaned from the results. Submitting one composite 0-6” sample from 20 randomly distributed sample locations in each field this fall may provide the simplest, least expensive snapshot of residual soil nutrient levels following this year’s crop. However, while this can be used to estimate the average fertilizer requirements for the next crop to be planted in that field, other sampling patterns may be more appropriate if you wish to track soil nutrient levels over years, or vary your fertilizer rates over the landscape to improve efficiency. 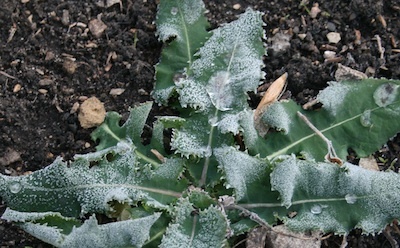 Weed control can still be achieved after a frost if no more than 40% of the original leaf tissue is damaged. Herbicide should be applied at the higher end of recommended rates in order to get the same amount of herbicide to the root mass, which is the target. 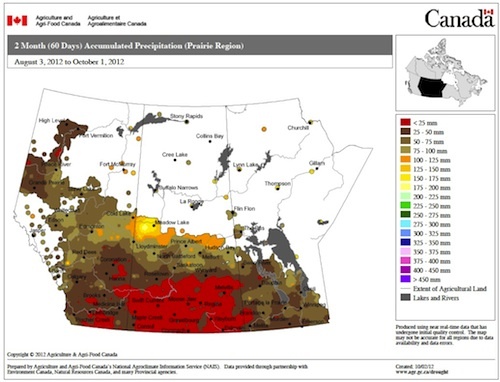 It has been a very dry two months, as the map shows. Several products with high carryover risk are broken down almost exclusively through hydrolysis — the process of water splitting the herbicide molecule in two. Hydrolytic breakdown of herbicides decreases in drought, as you can imagine, and adsorption of herbicide to soil particles is increased, both of which will increase carryover. Dry soils will be difficult to penetrate, and tillage will destroy standing stubble and its snow-catching capability. We can’t predict winter weather, but this extra moisture may be valuable next spring. Turning the soil can also cause a heavy flush of weeds from long buried seeds that have lost their dormancy, and burial of weed seeds and shattered canola seed will increase their longevity in the soil. Not a regular soil sampler? If you’re interested in starting, this is as good a time as any to start. The more you test, the more you can learn from the numbers. Benchmark samples collected from the same places for years will tell you more than a random sample done once. To see trends, you need several years. You can also learn to identify sample results that don’t seem right. The next issue of Canola Digest, the November issue, will include a Diagnostic Dilemmas feature about a grower puzzled by very low seedling emergence in his canola field. Crusting and cutworms were factors, but so was the 7.1-gram thousand seed weight. At the grower’s rate of 5 lb./ac., this amounted to 8.7 seeds per square foot. Seeding only 8.7 seeds per square foot doesn’t leave a margin for error, especially when 50% seedling survival is typical.